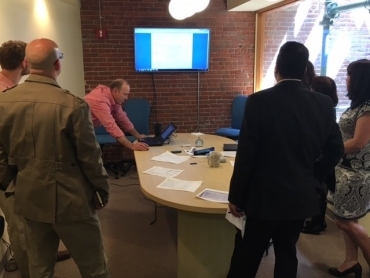 We had about 29 people sign up to come check out the Powerhouse Dynamics offices today during the NewCo Boston festival organized by MassTLC. 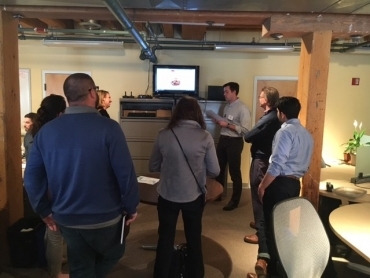 While our visitors ate lunch from SiteSage customer Au Bon Pain, our CEO Martin Flusberg entertained and informed them with the story of how Powerhouse Dynamics came to be, and why we’re growing so quickly. Time was tight, but we managed to give all of our visitors at least a taste (pun intended) of what we do and how we do it. We had a great time, and heard some very nice feedback from our guests (hint: feeding them is always a good move). Is your company considering becoming a HostCo at an upcoming NewCo festival? We highly recommend it! Click here for more information on NewCo.